I'm thinking about getting one of the craftsmen who make jewelry boxes (like on Etsy) to adapt one for razors. 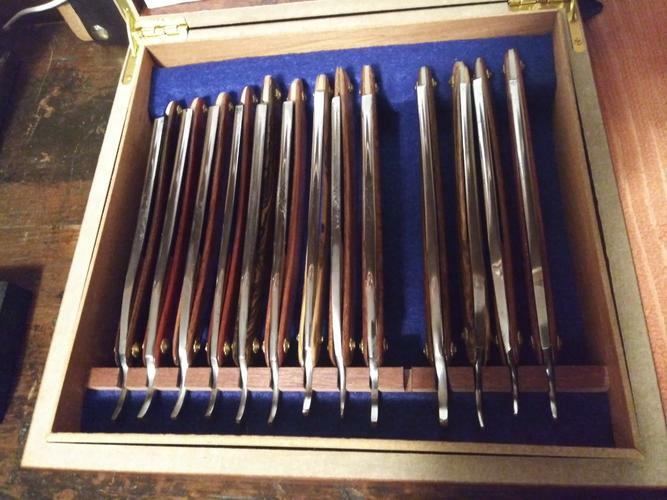 It would have one or two drawers that held them kind of like knifes in a silver cabinet. A rail about an inch from the front would have slots for the tangs, and another rail towards the back would have slots for the fronts of the razors. The razors could be lined up in a row, maybe about 1" apart. My question is, what would be the minimum and maximum length of the scales and tangs for common razors? Let's exclude really oddball ones, and Japanese razors, which are very different. I want to make sure the drawers are deep enough, and the rails are positioned so any razor I'm likely to buy can fit. My current razors are all around 6-6.5" long in total, with 1-1.25" tangs, and 5.25-5.75" scales. Don't know if that is representative, but I'd like to know if I'm likely to find one that is significantly longer or shorter. Also, my widest right now is 7/8, and it is just under 1" wide when in the scales. The widest razor I can imagine buying might be an 8/8, so that would need a bit over an inch in width, with the scales. I want to make sure the drawers are tall enough to accommodate the widest razor I may get. Send Outback a PM. I bet you can get all these measurments from him. Since it sounds like what you want made is what Mike made in the past. Excellent. I will ask him. Thanks! But just to get you started, Here is one I made out of a Cigar box. The space from box edge to the board that holds the tangs is 3/4"
The board that holds the tangs is 3/8"
Next space between tang board and Wedge end board is 5"
Board with notches for the pivots to sit in is 1 1/4" but as you can see, it didn't need to be that wide. I just wanted to fill the space in the box. The depth of the box including the lid is 2 1/4". I'd say the very minimum would need to be 1 3/4 if you were to put 8/8 razors in it. More is better just encase of a big smiler. The spacing between tangs is 1/2" on center. But these are all the same manufacturer of razors so they are all about identical. A little more space might be smarter if you were to have mixed sizes and manufacturers. niftyshaving, RezDog, JOB15 and 3 others like this. That sure helps, Jerry. That is exactly how I was thinking of supporting the razors, except in a drawer (or two) in a cabinet adapted from a standard jewelry chest design. Except, since the two rails at the front and back completely support the razors, there would be no need for a bottom panel in the drawers. That way, air could circulate. Somewhere, maybe below the bottom drawer, or above the top drawer, or maybe in the back, I'd leave room to affix a silica gel pack. A while back when I was thinking about wood drawers, I took some of my rotation and drew up plans then made boxes and dividers out of foam core. I am glad I did, before making out of wood, because I found out it did not work where I planned to use it, in a bathroom cabinet. I actually used the foam core divided boxes for a few months and they held up well. Buy good foam core, not dollar store, it’s not expensive, glued with White glue and dividers tacked in place with a dab of hot glue till the glue dries. I cut with a sharp razor knife, paper cutter will not work with foam. Measure your rotation and make a mock up, you will be happier in the long run. My goal was to get as many as possible in a limited space, with easy access. Last edited by Euclid440; 02-12-2019 at 11:13 PM. JOB15, Haroldg48 and pincorrect like this. What I’d do is: do a mock-up, but with just slots for the tangs. If you are concerned about air circulating, you can build it with a false bottom with desiccant underneath the false bottom. Razors should never be put away unless dry, so with a desiccant, a completely closed box is better, since it eliminates the variation from changes in room air humidity. I have gun safes that seal fairly tightly ( not fireproof sealed) and desiccant and anti corrosive and a Golden Rod, which is a heat source that eliminates the likelihood of condensation keeps everything pristine if put away clean. You only need at most the first two items in a closed case or drawer for razors. Start simple with your mock-up and modify the design as you go forward. Then if need be,you can ask a craftsman to build it. Doing a mock up with foam core sounds like a fantastic idea. I'll look for some of the good stuff. A full size mockup might prevent a lot trouble at the onset, and the foam sounds easy to work with. I have a big bag of silica crystals I use for a completely different purpose. (Providing water for insects our pet chameleon eats. But that's a whole 'nother forum!) But I it is same thing as the "Silica Gel Do Not Eat" packets. (Oh, come to think of it, I also use it for my cigars, but that's another forum too!) I can probably make custom desiccant packets from it. Harold, are the "anti corrosion" measures for your gun cabinet something like the "VCI emitters" RezDog mentioned in another thread? I think I will try to size the cabinet so there is an inch or so of space behind the drawers, or maybe an extra inch at the top or bottom where I can reach in when the drawers are out and tuck in stuff like that. Drawers without bottoms would need something to help keep them square. If it's just sided with the rail to hold the tangs and a rail to hold pivot ends I'm not sure that would be enough support. But as what was said, A razor should be 100% dry before putting it in any drawer. Then it doesn't matter much. All of mine are in drawers. But the drawers are a loose fit in the cabinet and I have one of those Do not Eat packets in each drawer. No problems so far.